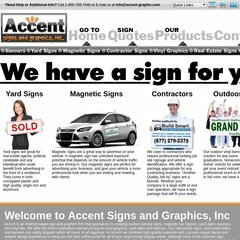 Topics: Full Color Digital Printing Services, and Accent Signs Store Front. Age: The domain is 15 years and 8 months old. 14 users visit the site each day, each viewing 1 page. Godaddy.com Inc (Arizona, Scottsdale) is the location of the Apache server. It has 2 DNS records, ns02.domaincontrol.com, and ns01.domaincontrol.com. Accent-graphic.com's server IP number is 72.167.232.6. PING (72.167.232.6) 56(84) bytes of data. A time of 59.2 ms, is recorded in a ping test.